I was a victim of (yet another) bad Microsoft Windows Update for Surface that wreaked havoc with wireless connectivity, cellular, and bluetooth. 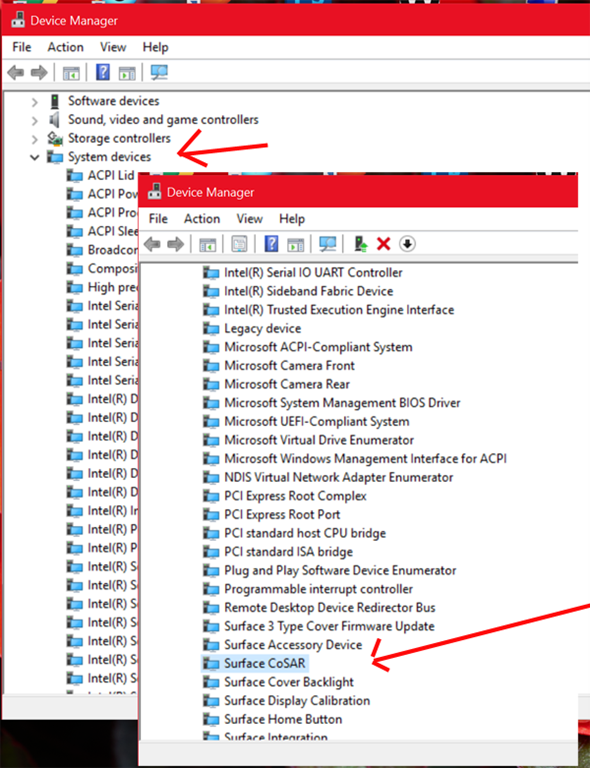 In addition to the inappropriate Surface Pen driver forced on unsuspecting SP3 users. Surface 3 LTE users also received a nasty surprise. Symptoms were coming back from hibernate, etc. I’d lose connectivity, WiFi would disappear, cellular would disappear, Bluetooth would disappear. Device manager would cycle through some weird messages when I checked the properties of the modem adapter and the wifi adapter, ending with Code 38. Bluetooth would be missing. 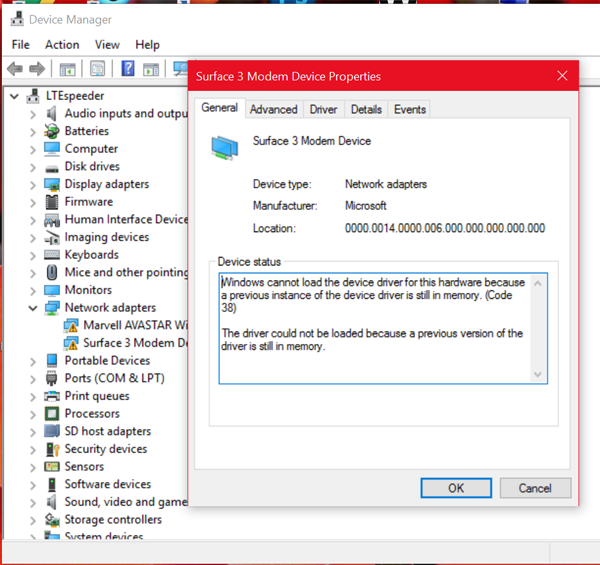 Here’s what the cellular modem driver looked like in Device Manager. EDIT: Microsoft has posted a KB and link to request a hotfix https://support.microsoft.com/en-us/kb/3138639. The hotfix leads to a requestable fix that is incorrectly labeled as for Surface PRO 3 and not Surface 3 LTE. 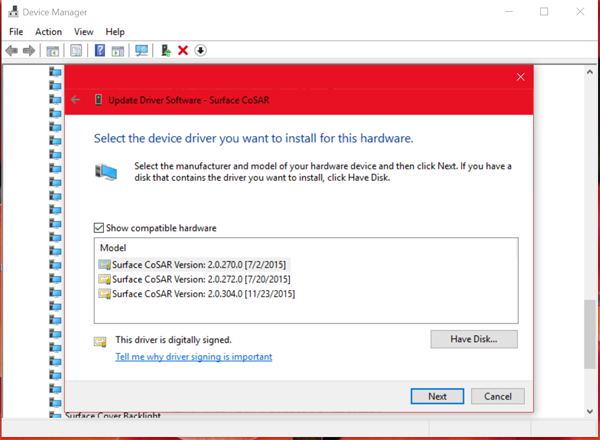 You’ll get a MSI that you can run to re-install the correct driver. If you want to fix it manually, steps are below. It’s what I did and it works. 2. Extract the Zip file and make a note of where it is exactly. 3. Open device manager and find System Devices and expand the tree. 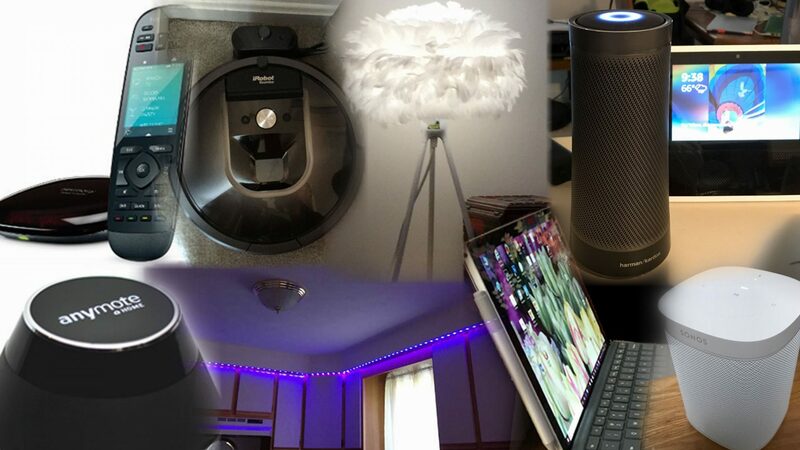 Scroll down through lots of entries and find Surface CoSAR. 4. Right Click/press and hold Surface CoSAR to display the Properties window and select Driver, Update Driver. 5. You need to use the force install, Browse your computer, Have disk process. Select Have Disk and then Next. 6. 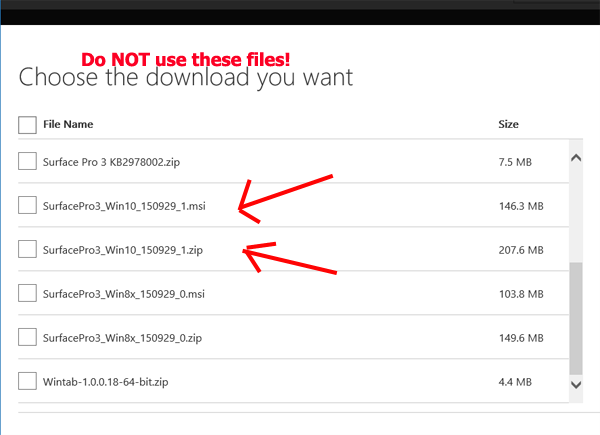 Now you need to navigate to where you extracted the Zip file. 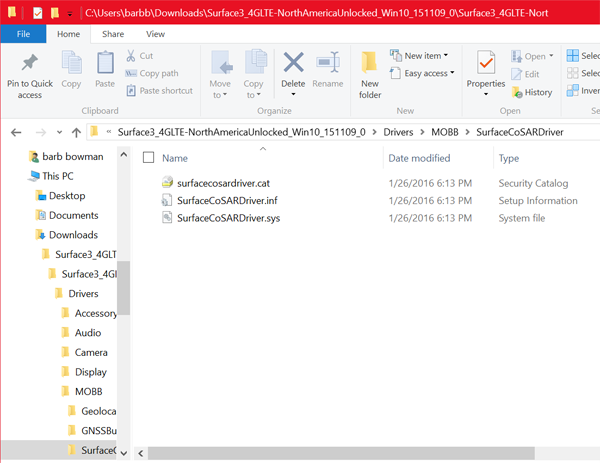 You’ll find the needed driver in the \Drivers\MOBB\SurfaceCoSarDriver folder – see screen shot below. (SurfaceCoSARDriver.inf). This is the driver you need to install. 7. After successful install, restart your Surface 3 LTE. I received this information on the cause being the CoSAR driver from Microsoft Engineering last night. So far, after implementing this fix, things are back to normal. Note, I also rolled back the Marvell wifi driver from .59 to .47 because .47 performs better for me. If you use my process above, please let me know on Twitter @barbbowman if this resolves your issue.